Well, I haven’t done one of these for a while but I’m stepping in for Catie who needs a break and we’ll see where we go from here! Anyway – on to the linky rules! 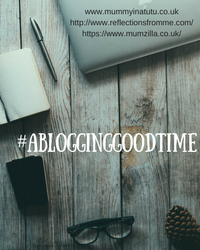 Join Katie (Mummy In A Tutu) Mac ( Reflections from Me) and I in a community of supportive bloggers. Link up and share all your experiences, successes and failures, laughter and tears. Why not share your favourite Posts, Craft ideas, recipes, days out, photo stories, weekly roundups etc with friends? All posts are welcome.